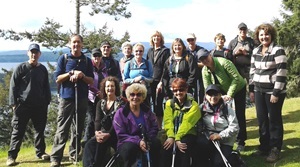 On Saturday, April 11, eighteen happy hikers boarded the Mayne Queen, cruising to the "exotic" Gulf Island of Galiano led by our trusty "Captain" Rodney Edwards. OK, perhaps a slight exaggeration, but there was no exaggerating our stellar day beginning with the dark curtain of clouds parting to reveal blue skies bathed in sunshine. Upon disembarking, our first port of call was Bluff Park but a sweet little bay at the foot of a flight of stairs beckoned us down. Half of us took the bait and succumbed to the warmth of the driftwood-strewn beach leaving the others to patiently wait for our return. Captain Rodney came down to roust us from our reverie and we soon joined the others to reach the Bluffs. Eagles soared overhead while the seals below honked out a welcome. We drank in the bucolic vista before winding our way along the cliff-hugging trail towards Mt. Galiano. The Mt Galiano trail is a gentle climb with decorations en route of ferns and moss-covered trees. And, as we crested the top, we were rewarded with a spectacular view of the strait below. In the glorious sunshine we enjoyed our lunch, gazing down at the cluster of islands floating on a silvery sea. Of course there were the ubiquitous photos before we reluctantly left this idyllic spot to hike the winding trail down with even more views of bays and beaches. Our trail descended to the road, past farm fields and a few funky stores inviting us to browse. Our last stop was a rewarding beer on the deck of the Hummingbird Pub where Mike was heard to comment, "I thought for a moment I was on a bike ride because we ended our day at a pub!" We lingered for an hour before the 2K. Sturdies Bay Trail led us back to the ferry terminal. 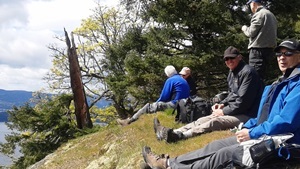 While waiting for the ferry we all agreed that our 20K hike was a winner, full of beautiful vistas, gentle trails and, best of all, great camaraderie. Let's do this hike again next year!